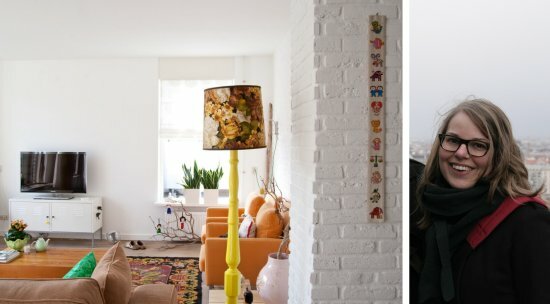 Marlous from the Netherlands crafts up whimsical wonders for her line Planet Fur, thrifts up a storm and finds colorful treasures for her lovely home, and runs an excellent blog on top of it all! She took some time out of her busy schedule to answer my questions on thrfting Dutch Style! Tell us a little bit about yourself, Marlous. My name is Marlous, I live in The Netherlands with my husband, Molly, our creature from Planet Fur (commonly known as cat) and two rabbits, Haas and Streep. I started thrifting about four years ago. I like the excitement of finding unique objects and the fact that, unlike common shops, the collection of a thriftshop is never the same! What do you think makes thrifting in The Netherlands different than thrifting in the United States or other places in the world? I happen to be able to compare thrifting in The Netherlands and the U.S. after our trip to California last April ;-) I guess thrifting has become a more common thing in The Netherlands and it has become harder to really find treasures, where as I think in the U.S. you can still find real treasures for little money because it’s less mainstream to thrift at all? In France, for example, everything that’s very old and broken is called “Brocante” and thriftshop owners ask ridiculously high prices for their stuff, just because brocante has become very popular in Europe. I refuse to pay 180 euros for an old and broken chandelier! Overall, I think you need to know where to look and what you are looking for. What are the names for "thrifting" in The Netherlands? Any special nick names? Is there a large thrifting/junking/second-hand shopping culture in The Netherlands? Yes, since popular interior magazines started to write about it, thrifting has definitely become very popular in The Netherlands. Is there a stigma against second-hand shopping in The Netherlands? Is it seen as something dirty or something for low-income families? I think it still has for people who don’t see the fun in roaming through piles of old dirty stuff. But I also think for a lot of people it’s still a way to spent little money on very basic things, just to make ends meat. Are there any flea markets in Netherlands? What are they like? Yes, there are. Very big ones during a Dutch day of celebration called Koninginnedag (the day our queen celebrates her birthday) and the one organised by churches. Since people often don’t see the value in the things they sell, big chance you’ll find something spectacular (in my experience). Not in the area we live in. Maybe in cities like Amsterdam or Rotterdam, but since thrifting has become very popular, I guess people will try to sell it as vintage first before they leave on the side on the road as household refuse. 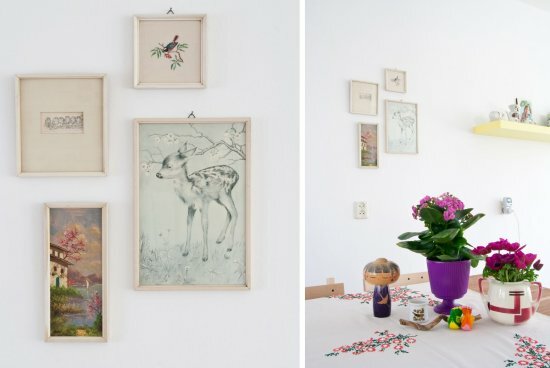 Is there a large thrift and craft culture in The Netherlands? There’s a large community on the internet with very kind, creative and thriftlovin’ people. I love to read about other people’s thrift finds. What are thrift stores like in The Netherlands? It really differs, but most of them are large and relatively neat. If you could thrift anywhere in the world, where would you go? I would definitely like to thrift sometime in some Scandinavian country. I completely relate to (and love) the clean yet colorful, playful and whimsical style of your home and online shop. What are your main inspirations? How does thrifting inspire the work you produce for your online shop? 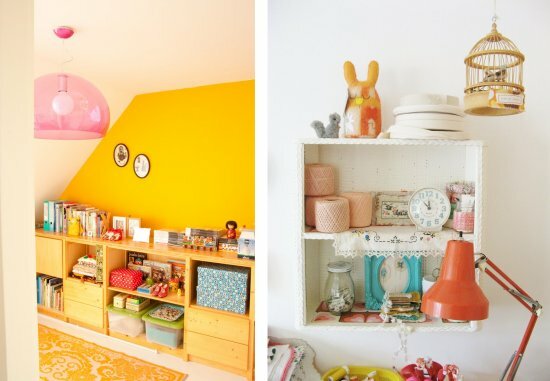 The bold and bright colors of the 60s and 70s are inspiring me to try new colorcombinations in my home and for my shop. And I can’t resist a good ol’ bunch of vintage buttons or other haberdashery. Crockery, tins and for some reason, I always seem to bump into fabulous wall hangings! 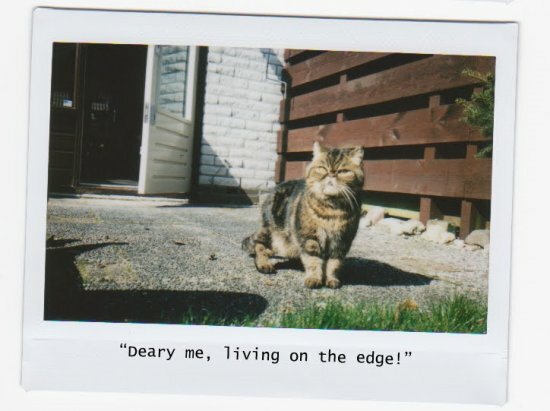 And randomly: can I have your kitty cat, Molly? I will name her "Teddy" and around her neck I will tie a little yellow ribbon. We'll frolic in fields of daisies together, she and I.
Heehee, your words about Molly made me laugh out loud. Funny thing is, we often call her Teddy, she indeed has the looks of a little brown teddy-bear. I think she’d even like the yellow ribbon, just because tying it around her neck would mean more attention for her! The meadow would be a problem though, she doesn’t climb, so when she leaves our garden, she’s totally lost and gets imprisoned in neighbors’ gardens and sheds all the time ;-) She’s the most funny and sweet creature we ever came across with! Marlous says: Thanks so much Vanessa, I had so much fun answering your questions! Have a lovely day (and a big Purrrrr from Little Molly, just for you)! 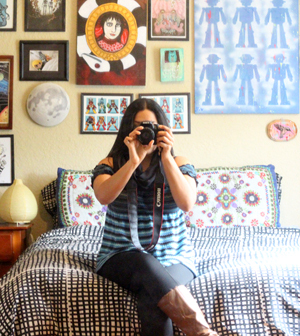 Check out Marlous' gorgeous photos on Flickr and don't forget to look at her home tour on Apartment Therapy.I almost flipped backward in my chair; it love at first sight with that home full of playful thrifted finds! That cat is too much! And so is the proverbial Planet Fur abode, make sure you check out their home tour, the house is gorgeous! Wow, I love the overall design and color palette of Marlous' home. I really think that if an average anti-thrift person saw what lovely things are possible with thrifted finds, they'd convert! Jackie: I'm just completely in love with her house, and you're right, I think it would convert ANYONE to the thrifts! Great interview! Thanks so much for the introduction. It was one of those, "how am I already not following this person's blog!?" moments. I popped over and became a follower right away. Her house and sense of style is wonderful! 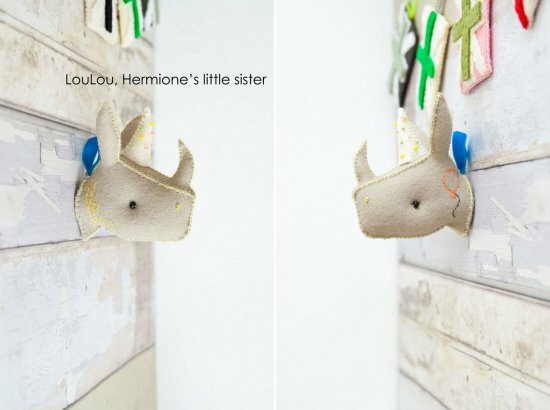 Flo: She's definitely one to follow, I love her photos and beautiful vintage finds!